Does this sound familiar? Your alarm goes off, you roll over still half asleep when suddenly you remember that email you need to send, that project you need to get started on, that business call you need to make. Before you know it, your whole to-do list has just shot into your mind and next thing you know, you’re in an instant panic thinking of the 101 million things you have to do today! This is pretty much how my weekdays have been starting out for me lately. As my business is becoming more and more successful each day, I quickly find the to-do lists piling up, and the overwhelm that sets in first thing in the morning, somewhat debilitating, and let’s not even get started on the anxious tummy turning circles that often accompany it! Oftentimes we are in so much of a rush at the beginning of the day that we miss some important steps in making sure our day goes well. Yes, there are actually things you can do to ensure your day is set up to be more successful and more productive from the moment you wake! Here are some of my tips I’ve found over the last year or so that have really helped me get my day started off right. I also find my mood is lightened and I feel more energetic, positive, and motivated when I take the time to do these steps each morning, and on the days I miss out, boy can I tell a difference! 1. Start the Day with Gratitude. First thing when you wake, set aside the to-do list and instead say “Thank You” in your mind or out loud for the new day. Then, think of 3-5 things you are truly grateful. This can be anything at all from your husband and kids, to your beautiful home, your good health, food to eat, or that fabulous new pair of shoes you were able to purchase over the weekend. Whatever it is, let yourself get immersed in the feeling for a few minutes. Really think about what it is you’re grateful for and really feel it. Give yourself a few minutes to do this until your heart begins to swell with happiness and gratitude. When your heart is filled with gratitude, it shuts out any stress, fearful, or anxious feelings you may be feeling. 2. Set your Intention for the Day. This step, like gratitude, is a very important and a vital step to starting your day out on a high note. Once you’ve thought about the things you are most grateful for, begin going through your day in your mind and set your intentions for the day. I like to think about everything I will be doing that day, and then slowly going through each thing in my mind, imagining it going the best it possibly could. I also take it a step further and use Rhonda Byrne’s advice from “The Secret” to say “Thank You” again for each of those things going well during my day. I also think about some of my major goals I have for my work, home, and personal life, and imagine them coming true. Like gratitude, imagery is a very powerful tool that has been used by many successful people time and time again, and setting goals is always a great way to help keep you on track, as well as track how your progress is going on each goal, so you can feel grateful and happy for the outcomes you are receiving. 3. Meditate. I know what you’re thinking, who has time for that, especially first thing in the morning? But I promise you, if you can set even 5-10 minutes aside each morning to quiet the mind, you will soon begin to notice a big difference in how much more focused you are for the day and how much more positive and calm you will soon find yourself feeling more regularly too. Set aside some time to sit quietly, and focus for a few minutes on your breathing. Imagine yourself being filled up with energy and positivity on each inhale, and let go of the stress, anxiety and overwhelm with each exhale. 4. Eat a Healthy and Mindful Breakfast. Like meditating, this can be an important step to take each morning to help you quiet the mind and bring more peace into your day. If you live or eat breakfast alone, resist the urge to check your phone and instead focus on each bite of food. Savoring the taste and thinking about how it is nourishing your body and giving it strength and energy. If you eat with a spouse and/or your kids, take this time to focus on them and your relationships. Ask them about what they are excited for today, get some good engaging conversation going, and give yourself this time to think about how much you appreciate and love them. Relationships play a HUGELY important role in our happiness, and taking the time (without phones) to connect with loved ones can be a very energizing and fulfilling way to start the day. 5. Keep Yourself Organized and Productive. Ever notice how much time you waste in the bathroom getting ready each morning, simply by looking at your phone? My phone dings like crazy first thing in the morning as I have work messages, emails, and Facebook notifications coming in rapidly. I find myself constantly picking up my phone to check each message, and I’m wasting precious time in the morning doing this, not to mention it’s a bit stressful too – constantly picking up my phone to check it, then setting it down and trying to get back to curling my hair. MirroCool is a groundbreaking new touch-free, voice-free smart mirror with a personal assistant built right in! 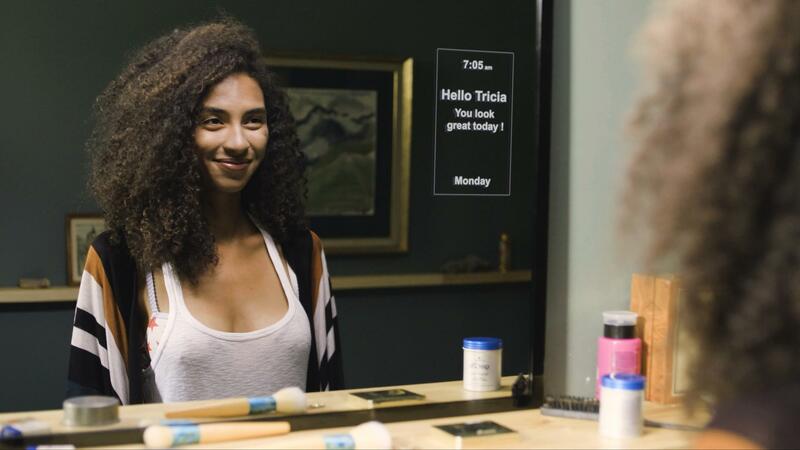 Built with facial gesture recognition, this mirror is able to recognize you (and all others in your household) and can recognize up to 70 unique facial positions and use these to complete tasks and other functions. You don’t need to speak to or tap the mirror, but instead simply give it a facial gesture, such as smiling to quickly get all the information you need – including upcoming appointments, medical reminders, current traffic, breaking news, and weather conditions too. MirroCool activates once it recognizes your face. Even while brushing your teeth, blow-drying your hair, or applying your makeup. The handy mirror helps increase your morning efficiency by helping you organize your day while you get ready for it! Simply connect your phone via the app, to receive messages, emails, and texts – sent directly to, and shown right in your MirroCool. It will also notify you of your daily to-do list too and any calendar appointments too. It’s also got a handy built-in camera for selfies that can be shared to social media. You also get peace of mind with MirroCool’s built in Security Camera. Select MirrorCool’s Home-away mode, and the motion sensor will snap a picture of an unrecognized face during a break in, which is then stored in the cloud and sent to your phone to alert you. Mornings don’t have to be stressful and crazy, and hopefully armed with these tips, you’ll find yourself starting your day off on the right foot, happy, grateful, energized, and more productive and organized too!